Preheat oven to 400º. Chop bacon into small pieces and cook in an oven-safe skillet over medium-low heat until crisp, approximately 20 minutes. While the bacon is cooking, mix together cornmeal, flour, baking powder, baking soda, and salt. In a separate bowl, combine eggs, butter, and buttermilk. Carefully fold wet ingredients into dry ingredients. Set aside bacon and drain off drippings. 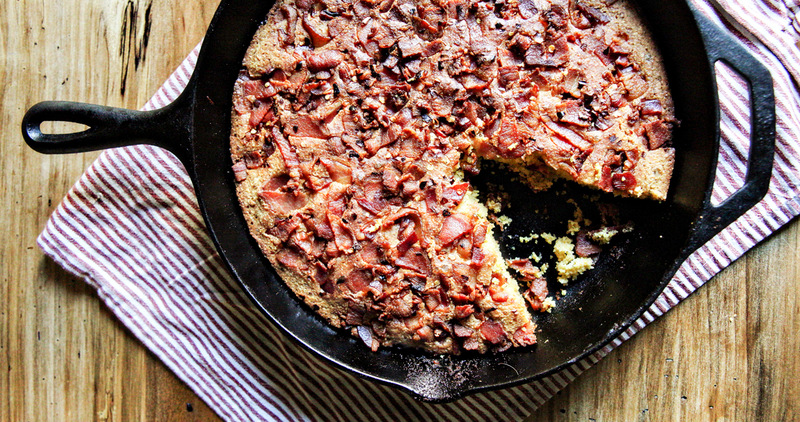 Pour cornbread batter into the skillet and top with bacon and red pepper flakes. Bake for 20 to 25 minutes or until the cornbread is golden brown.